Long Description: It’s important to understand that workplace bullying is a risk to health and safety of an individual. It can occur wherever people work together in all types of workplaces. It’s best to prevent and reduce its occurrence if it happens. Workplace bullying is verbal, physical, social or psychological abuse by one person or group of people at work to another person. For example: yelling, name calling, threatening and isolation, keeping the person out of work or staff conversations. Is this real or am I overly sensitive to the situation? Is it happening only to me? How often is this happening? Is the behavior a risk to my health & safety? Document everything like time, place, date, what did the bully/perpetrator do/say, how did you react, and what actions did you take to reduce/stop the occurrences. This will help you in two ways; first it will help you assess the situations objectively and second it will help you document evidences to build a strong case in your support. Share your views and experience with someone you trust and confide into. If you do not have anyone, you can approach support services like HR or EAP counselors. This will help you in gaining confidence to deal with the bully as well as to place your case before the authorities. Be assertive and ask the bully to stop. Remember that what the bully is doing with you is not about you or your work but rather it is his/her own need for security, control and power. The more you fret, the more the perpetrator will be encouraged. Be aware about the fact that aggression for aggression doesn’t work, be calm and assertive while asking the bully to stop. After approaching the bully if the situation continues or worsens; it’s better to report. You can report to you supervisor or manager. If the bully is your immediate reporting head, you can approach your health & safety authorities or HR or EAP Counselors. 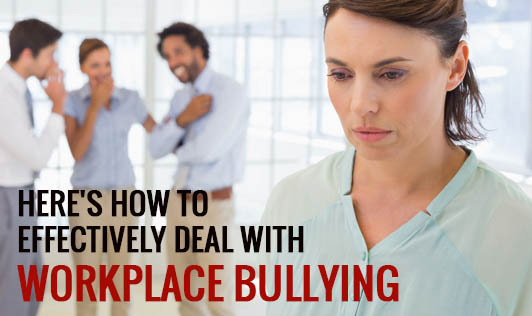 Coping with bullying in the workplace can be really challenging, it’s best to act as early as possible to facilitate better working conditions. Thus giving you a sense of control and relieving you from victimization.